Every so often even the most careful among us is bound to bumble into the path of history. Until quite recently, this had only happened to me time: when I shared the city of New York with the Occupy Wall Street movement. In 2011, I was working in Lincoln hospital in the Bronx, living on 135th street in Harlem, and every so often I passed by that persistent and creatively disruptive group of folks holding court in Zuccotti Park. In contrast to the popular image, Occupy Wall Street didn’t look like a turbulent social movement so much as an average day in a college co-op: complete with piles of books, drum circles, a few signs and a makeshift soup kitchen. You might think that the effect of having a co-op squatting in the world financial headquarters would be a bit like an arc of left-leaning aliens touching down on PLANET CORPORATE. However, the effect was pretty much the opposite. It was the pinstriped investment bankers and tight-lipped security guards who seemed wildly out of place. To a man – I never saw women in those streets, now that I think about it – to a man they looked if they’d lost their way to the lobster dinner at a national accounting convention. Now, they were helplessly adrift in some liberal college’s 15th class reunion. Everyone who wasn’t singing, cooking, playing a musical instrument, making art or conversation, holding a sign or reading quietly on the grass seemed woefully uncomfortable. In other words, Occupy Wallstreet had landed. Planet Corporate was having a wee bit of trouble adjusting. I can’t claim that I understood what it meant then, in the greater social context of this nation or the world. I’m not sure that I do now. What I can say is that a group of people agreed on a plan, executed it, and made history. From one day to the next, the terms of what was possible changed forevermore. So it goes with any memorable human endeavor, I think. People come together to pursue a common vision. If the vision is grand, the boundaries that define humanity are stretched. This is not always for the better (see ISIS). We do set our sites higher, though, the results can be darned impressive. I don’t always mean rocketing to the stars (though sometimes I most certainly DO). Taking space travel as an example, when people find a reason to get along, they suddenly become very high functioning. Take this evening. Around 9:30 PM, there a was a knock on the door. It was loud – almost insistent. My husband stood up from the couch where were were both working to get it. A moment or two later I heard him say, “a package? For US?” I joined him at the door. Two young kids – African American, neatly dressed, hair braided – were standing on doorstep. A white pontiac was at the curb with the motor running. “We have a package for you,” said the slightly older of the two. The younger one just grinned. “Oh yes?” I stepped out of the door. “We have a package for you!” called a voice from within the white Pontiac. I approached the car with two girls following closely at my heels. Beneath her immaculate, colorful, plastic-clipped braids, the girl in the pink shirt ogled me with her big brown eyes. True, my husband and I are the only non-African American couple on the block. Still, we’re not typically the subject of any protracted wonderment. “I saw you on Facebook!” the lady shouted from the car. “You’re the astronaut!” And she started laughing. “Thank you, Ma’m!” I had to laugh, too. As I keep saying to anyone who will listen, I’m a just simulated astronaut. The effect, as we’ve previous discussed, is genuine. I can’t discount it. It does more than bring me my mis-delivered mail at odd hours. My existence on this planet means that we’re headed for Mars someday, maybe even someday soon. The important part of that phrase, I believe, is not so much the “Mars” as the “we’re headed.” We are all going. I’m going to Hawaii now. Then a handful will make it all the way there. At that point, we will have gone to Mars. Humanity will have solved that particular problem – which is really a million problems wrapped up in one dusty red package. Delivered in the waning hours of the night by a neighbor you have never met, and her daughters, who will look at you and grin because…well, space travel is cool. Even when you aren’t in space. People. We set our minds to it. We make it there. Then we turn around and from that distance see that other problems – pollution and poverty and healthcare and education – are, of course, solvable. Walking on other planets implies that we can get it together on our home planet, if we come to an agreement and execute a plan. I very much hope to live to see that future. In the meanwhile, just the thought that we are starting to head in that general direction is already making the world a better place. I wave goodbye to the lady and her two daughters. Standing on the doorstep under our parchment yellow porch light, I tore open the plastic white mailer. Inside was a gift from my first cousin Vanessa, one of the head engineers at SpaceX. She was on the ground in Florida to handle the last launch. She was there to pick up the pieces when the Dragon capsule and its payload exploded. Ever since, she’s been running around like crazy, making changes to get the next one up in one piece. First payloads, then people. All the folks at SpaceX working like mad to make commercial spaceflight a reality. To reset the human boundary. Still, she found time to send me a going-away present. Living in St. Louis in 2015, what I see more than anything else is this: people trying to reset the boundary for the better. A whole lot bunch of folks have sights set on getting one thing done right: recovering from what happened in Ferguson, repairing a city that fell into ruin after the second world war, delivering mail to people about to occupy a dome as if they were on Mars. In less than a generation, if we set our minds to it, we will be packing a group of people off to the 4th planet from the Sun, where, once upon a time, where were oceans and an atmosphere. Then Martian dynamo died. The planet’s beating heart went still. As the core cooled, the Mars’ protective magnetic field vanished, and the solar wind began stripping away everything that could have supported life. That is, until we packed our bags, rolled in with our gear, and changed the rules. The same species who landed on the beach in Normandy in 1944, on the Moon in 1969, and a comet in 2014 now brings you: #occupymars. Roll out the welcome mat. The humans have landed. I’m an editor at the Huffington Post and came across your fascinating story. 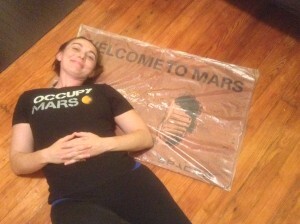 Would you be interested in posting something with on your “Mars” journey? If so, we’d love to share your voice on HuffPost. Bloggers retain all rights to the use their work elsewhere. We’d be happy to link back to your personal blog. Please email me at hayley.miller@huffingtonpost.com, if interested. Hope to hear from you! Copyright © 2019 Sheyna Gifford's Homepage. All Rights Reserved.